Saw it parked closer to runway 27 in BOM this morning. Looks great in 9W livery with the split scimitar winglets. What is the status of 9W and EY now? They have stopped announcing the EY partner welcome. The EY partner logo has vanished from the boarding passes. Do 9W plat/gold members still earn privileges and benefits while flying EY like before? The 9W/EY relationship is totally weird for an investment relationship. I've always wondered what the real deal is between them. For instance if EY really did invest in them (for an equity stake), why not lease on the cheap planes to 9W so that they can serve more routes. If 9W is super strong, EY would have benefitted as the second frequency being one stop via AUH. Just like DL/AF/KL do. You might fly nonstop JFK-MAD but return MAD-CDG-JFK so you can leave MAD in the afternoon instead of am. What ever, 9W should just sell their soul to DL/AF/KL/VS. At least DL knows how to run an airline and grow most investments. I get the feeling that something stops 9W from achieving its full potential. Got to be the people who run it. All said and done, AI has better route map that 9W, with all the latter's hype. To be fair I have done that with 9W/EY - flew BLR-MAA-CDG on 9W and CDG-AUH-BLR on EY. Agreed. They just had so much more potential to expand that offering. Instead EY tried to limit 9W’s network west (if these forums are to be believed). Also EY keeps planes on the ground in AUH. 9W would be a perfect place for some cheap leases. What I like about the 9W/DL partnership is that DL/VS/AF/KL are happy to have 9W fly routes from India to EU (encourage 9W to expand) and, I think, will have them flying to the US once a JV is in place. With EU flights from MAA and BLR, it would have been good for 9W to operate connector flights from other parts of the south (COK, TRV, CCJ, IXM, CJB, TRZ) to either MAA or BLR. This year checking fares from BOS to TRV, did see a lot of good fares on EU carriers + 9W/AI, which usually doesnt happen. The long transit times at BOM or DEL is the other part of this puzzle that has to be solved. 9W launching HYD-IDR-IXC and BLR-GAU non-stop. NEW DELHI: Jet Airways has informed its employees that the airline will not be able to operate beyond 60 days unless cost cutting measures, which include pay cuts, are put in place, two executives confirmed to ET. The management team, including its chairman Naresh Goyal, informed employees in face-to-face meetings in recent days in Mumbai and Delhi that the airline’s financials are in a bad shape and drastic measures needed to be taken to cut costs. The warnings of low cash levels have rattled employees at India’s oldest private sector airline, who have been told in recent days to take up to 25% cut in salaries, and triggered protests. ET was the first to report about the pay cuts on Wednesday. Employees are trying to figure out what to make of these warnings with some saying that the situation probably has been exaggerated to make some employees leave. Jet Airways said it is implementing several measures to cut cost. But the airline did not give specific answer on the 60-day deadline given to employees. “In line with its stated focus of creating a healthier and a more resilient business, Jet Airways has been implementing several measures to help it reduce cost as well as realise higher revenues, for desired business efficiencies. Some of these include sales and distribution, payroll, and maintenance, among many others. As part of this approach, the airline management is in dialogue with key stakeholders to enlist their full support and cooperation for realising necessary savings across all parts of the business,” Jet Airways said in a response. “The airline is committed to create a growth-oriented, sustainable future and a revitalised guest experience armed with the addition of 225 B737 MAX fuel-efficient aircraft which will be inducted in its fleet over the next decade, and of which 11 are slated to join within this financial year. The airline refutes and strongly condemns the speculative comments of/from certain vested interests, who are making deliberate attempts to undermine Jet Airways’ transformation efforts,” it added. Executives said that the airline has also started firing people across functions and has already asked some people from the engineering department to leave. “In the engineering department, head of line for Delhi has been asked to leave. Job losses will start to happen in functions like cabin crew and ground handling,” executives added. The airline has also decided to waive the bond terms of seven years or Rs 1 crore for its first officers and the mandatory one year notice period for pilots, including commanders. The airline’s management team, headed by founder Goyal, met employees in Mumbai and told them that the cut will be for 24 months and that no refunds will be made. On Thursday, the management met employees in Delhi but Goyal did not attend the meeting. The management has blamed rising fuel prices and major market share gains by IndiGo for its precarious financial position, the executives said. After two consecutive years of profits in fiscal 2016 and 2017, Jet incurred losses of about Rs 767 crore in FY2018. Industry analysts say that it is likely to report a loss of Rs 1,000 crore in the first quarter of the current fiscal. Jet is not the only carrier to be affected by intense cut-throat competition and rising fuel costs. IndiGo, India’s largest carrier by passengers flown, reported a 91% drop in profits for the first quarter of this fiscal on Monday. Things are looking pretty shaky at 9W, it seems. I think they should end the AMS and CDG flights. Can't see those being profitable. They should consider flying directly to the US. If AI can make the HYD-DEL-ORD and the BOM-DEL-JFK routes work, surely 9W can. On the contrary CDG and AMS flights are doing well for them. This seems to be a case of reducing the acquisition cost for DL/AF to pick up the EY stake. So 9W declares 'bankruptcy' only so that it's share values tank, thereby making it easier for DL/AF to acquire EY's stake. And they think EY is so full of bungling oafs that they won't see through the game? This is beyond ridiculous. What confidence will 9Ws investors have in the company if it indulges in such slimy games? Only goes to show that NG, despite all his achievements, is still a two bit dalal. Primary reason is the fuel price increase. Even Indigo has reported 91% drop in profits. Additional factors are intense competition in domestic sector, inability of Jet to expand from BOM in the domestic sector due to airport constraints. I suspect CDG-MAA flight is probably not doing too well with LH, EK, QR, BA , AI covering most of the European and US/Canada connections, there cannot be much more traffic to be had. You might have read recent media reports questioning the sustainability of our airline. We have already clarified to the media that these reports are factually incorrect and malicious. The Indian aviation sector is experiencing strong growth and Jet Airways is well placed to be a part of this growth story. We are committed to creating a growth-oriented and sustainable future for all our stakeholders. We will continue to expand our network, both domestic and international, and revitalise our guest experience. This will be augmented with the addition of 225 Boeing 737-MAX fuel efficient aircraft, 11 of which are scheduled to be inducted into our fleet this fiscal. Despite the high growth environment, the aviation industry is currently passing through a challenging phase, given a depreciating rupee and the mismatch between high fuel prices and low fares. Needless to state that Jet Airways has been in existence for over 25 years and through these years, we have been successful in combating such business volatility. Jet Airways will continue to accord the highest priority to safety, backed by our signature warm Indian hospitality and reputed award-winning loyalty programme. Jet Airways in this past week’s schedule update filed additional frequency for its planned Mumbai – Manchester route, set to commence on 05NOV18, subject to Government Approval. The airline currently displays 5 weekly flights, instead of 4, with extra flight added on Fridays, with Airbus A330-200 aircraft. Can Jet sue TOI and any other publications. I am wrong. This time TOI's story holds. It does appear Jet airways is in trouble, their stock is suffering when the overall market has risen. Everything Etihad touches is turning into dust. May be bad karma to be associated with Etihad. Could mean jail term for the person responsible for depositing TDS. Usually big shots get away with it but small businesses are harassed by the IT dept. The troubles of turbulence-hit Jet Airways are showing no signs of abatement. Days after Naresh Goyal-owned airline deferred the quarterly financial results, audit firm BSR & Co, an affiliate of KPMG India, has reportedly refused to sign the first quarter results of Jet Airways due to differing views over interpretations of some accounting rules, The Economic Times reported. It added that BSR might even consider resigning from the account if the issue is not resolved. In another report, the daily said that the debt-laden airline has initiated a formal stake-sale process to raise $350-400 million from global private equity firms. The full-service carrier is going through rough weather owing to rise in fuel costs and pile up of interests due to huge debt on its books. It added that Jet Airways has put out feelers to PE funds including Blackstone, TPG and Indigo Capital Partners. The troubled airline is planning to monetise its JPMiles programme. Jet Airways had sold the majority stake of its frequent flyer loyalty programme to Etihad Airways in 2014. 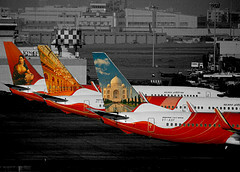 The Gulf-based carrier had picked up 50.1 per cent stake in JetPrivilege for $150 million. Goyal, who raised Jet Airways from the scratch after India opened its skies for private carriers in 1991, has roped in an investment bank to offload some of the stake, the report said. In 2013, Jet Airways had sold 24 per cent equity to Etihad Airways for $379 million after the government allowed foreign airlines to take up to 49 per cent stake in Indian carriers. Jet Airways' negative net worth is well over Rs 7,000 crore with total liabilities of Rs 19,743 crore against total assets of Rs 12,501 crore. In May 2018, ratings agency ICRA lowered credit ratings on its short-term and long-term loans due to weakening finances. The airline's cost of fuel as a percentage of operations shot up from nearly 40 per cent 2 years ago to nearly 65 per cent today. "We have noticed a difference in your response dated August 10,2018. Hence kindly clarify whether the management sought extension from audit committee as per your response dated August 10, 2018 or Audit committee did not recommend the said financial result to the Board as per your announcement dated August 9, 2018,” the NSE queried Jet. “In your response dated August 10, 2018 the details of certain matters which has been not closed is not provided . Kindly provide us the exact reasons for which Audit committee has not approved the financial result,” it added, also asking Jet to provide a subsequent date for its board meeting to consider its earnings. Jet Airways on Thursday started an initiative called “Seat Select” sale under which the passengers will now get the opportunity to choose their preferred seats by paying a nominal fee. The officials of the airline said that the same was applicable for all Jet airways flights across their network of 45 destinations. Apart from the domestic flyers, the initiative will be applicable for the international passengers while traveling with the Jet Airways for their onward journey in the country. The limited offer, as officials said, will be valid from August 16 to August 31. However, they added that economy guests could select any seat of their choice by paying a fee of Rs 200 regardless of the travel date. All seats with the exception of a few such as the front row seats and those in the emergency rows will be available for selection as part of the sale, the officials pointed out. To avail the offer, the passengers could visit the ticketing offices of the airline at the airports or anywhere in the city in addition to calling the airline’s call centre or by visiting the website or the mobile application of the airline. Marnix H Fruitema, executive vice president - commercial, Jet Airways, said, "Seat Select is increasingly becoming the mainstay of our guest preferences while travelling with Jet Airways. The 15-day sale will not only offer special prices to our regular fliers but will also attract and enable new guests to experience the advantages of this concept." Sources say the airline is working on a transformation plan that includes things like reducing the high sales & distribution and employee costs. “Bringing in other efficiencies like buy-on-board is part of this. There are several components of this work-in-progress plan, some of which are not moving well like the plan to cut pilot salaries which faced stiff resistance,” said a source. But the airline knows that a gap between revenue and expenditure for a very long period could spell a problem for it. “While remaining full service carrier (FSC), all possible steps to increase revenue, reduce costs and improve passenger experience will be taken,” said a person in the know of developments. JetKonnect fiasco all over again? Flew Jet recently from BLR to UDR - given the choice between serving the food that they currently serve, and not serving food, they should stop serving food. The quality of the food was a huge negative on the experience for me. 9W and AI should stop serving meals on all domestic flights of less than 2 hour duration. A drink and a small packet of munchies are more than enough. I remember IA used to serve something like a samosa (it was not a samosa but a fried cutlet) on short routes. You are right though. No meal needed under 2 hours (maybe still in J). Jet Airways has added a new 737-8MAX to the fleet today, as VT-JXC. et Airways makes Q1 loss of ₹1,323 cr. on fuel, currency impact. The key is to find out how much of this was caused by fuel prices and currency. Jet gets a good chunk of its revenue from international ops and should have less currency fluctuation problems unlike Indigo or Spicejet. Jet Airways has added a new 737-8MAX to the fleet today, as VT-JXD. Jet Airways, which reported a loss of Rs 1,326 crore in April-June quarter, plans to sell and lease back "a portion" of the 16 aircraft it owns. The airline management estimates the market value of these aircraft over $750-800 million. Speaking during a conference call with the analysts, Amit Agarwal, CFO and deputy CEO of Jet Airways, referring to the monetary value of these aircraft said, "We have a clear intent to put a portion of these to sale and lease back. Clearly there is a huge equity sitting there," Agarwal said. Jet Airways is set to introduce 28 new flights in the coming month, including flights from Indore to Jodhpur and Vadodara and between Chandigarh and Lucknow, Ahmedabad and Jodhpur as well as Vadodara and Jaipur. Being a network carrier, Jet Airways' new services - including industry firsts as well as a mix of non-stop and one-stop flights - will strengthen the airline's footprint, enabling it to meet the rising demand for domestic and international air travel in emerging cities. The new services will also help connect guests with other cities including metros as well as the airline's global network via its hubs in Mumbai, Delhi, and Bengaluru. In a series of industry-firsts, Jet Airways will introduce daily flights from Indore, connecting the 'largest city in Madhya Pradesh' to Jodhpur as well as to Vadodara. In other notable firsts, Jet Airways is also set to commence flight operations between Chandigarh and Lucknow, Ahmedabad and Jodhpur as well as Vadodara and Jaipur. Jet Airways will be the only airline in the country operating these routes which will improve connectivity between north India and central as well as western India. The airline is also introducing additional frequencies on key existing routes, expanding non-stop capacity between Mumbai - Guwahati and Delhi -Bagdogra and providing additional one-stop connectivity on the Mumbai -Bagdogra and New Delhi - Guwahati routes. Among other network enhancements, the schedule will see Jet Airways launch non-stop flights connecting Bengaluru with Lucknow, Indore with Kolkata, Kolkata with Chandigarh, Coimbatore with Hyderabad, Visakhapatnam with Mumbai and Delhi, reflecting the growing demand for its services to facilitate the travel aspirations of its guests. The airline's focus on Indore is evident, given that the city is fast shaping up as a key pillar in its pan-India network due to its central location and expanding infrastructure. Jet Airways is all set to deepen it's connect with Indore by offering services to 14 cities across the country. In fact, the airline will be the only one providing non-stop connectivity from Indore to emerging markets and mini metros such as Ahmedabad, Jaipur, Vadodara, Jodhpur, Allahabad, Chandigarh, Lucknow, Nagpur and Pune. Jet Airways will also provide non-stop connectivity from Indore to metros such as Kolkata and Hyderabad as well as its hubs in Mumbai, Delhi and Bengaluru channelising network traffic seamlessly to its international network. The airline's latest service to Kolkata will finally link it to the main commercial and financial hub of East. The new and existing flights will also enable Jet Airways' guests to avail the airline's day-return services from Indore to Mumbai, Delhi, Ahmedabad, Jaipur and Nagpur. Further, guests from Bengaluru, Hyderabad, Pune and Kolkata will now have additional connectivity to Jodhpur, Allahabad, Vadodara and vice versa via Indore, according to a company statement here. Jet Airways and Bangkok Airways last week expanded codeshare partnership, cover service within India and Thailand, as well as selected service between Thailand and Vietnam. Following codeshare routes went into effect on 23AUG18. Jet Airways will start direct services between Mumbai and Manchester from November 5, with five flights every week. A wide-body A330-200 aircraft, having 254 seats, would be deployed for the direct flight to Manchester in the UK, the airline said Wednesday. It would operate the flight "five days a week including Thursday, Friday, Saturday, Sunday and Monday. Manchester would be the 21st international destination for Jet Airways and fifth non-stop service to and from the UK. "Jet Airways' flight 9W 130 will depart from Mumbai at 0230 hours and arrive in Manchester's Terminal 2 at 0755 hours (local time). The return flight, 9W 129 will depart from Manchester at 0930 hrs (local time) and arrive in Mumbai's Terminal 2 at 0040 hours," the release said. Jet Airways is in talks with Muscat-based Oman Air to wet-lease three of its widebody aircraft, the A330s, and few of its narrowbody Boeing 737s, sources in the know of the discussions told FE. The number of the Boeing737 aircraft to be leased, however, could not be ascertained. Nearly 150 of Jet’s cabin crew have already been interviewed for the same. Jet Airways in recent weeks gradually filed planned 737 MAX 8 operations for international routes during winter 2018/19 season, effective 28OCT18. The following is the list of planned MAX 8 service, as of 17SEP18. Two years after the successful introduction of ‘Fare Choices’, we have made further enhancements to bring you more value for money, by letting you choose a travel plan based on your preference, travel requirements and budget. Fare Choices in Economy currently offers a total of five fare options viz. 'Light', 'Deal', 'Saver', 'Classic' and 'Flex'. We have now unbundled fares in 'Light' and 'Deal' categories of Fare Choices in Economy, for flights within India, providing our lowest fare options, as consumer surveys clearly reveal that guests want the flexibility of enjoying competitive fares with the options to buy meals. With this enhancement, guests now have the flexibility to choose fares offering flight+meal or flight only option. From 25th September 2018, guests travelling in Economy and booking ‘Light’/’Deal’ fares for travel from 28th September 2018 on flights within India (our domestic network) will not only be able to avail competitive low fares but have the opportunity to buy meals from a specially curated on-board menu. Guests can choose from vegetarian and non-vegetarian meals, including hot meal options on select flights and pay using their debit / credit cards. Complimentary beverage service including tea and coffee to all guests in Economy (including ‘Light’/’Deal’ fares), will continue on eligible flights. We will continue to offer complimentary meals across 'Light'/'Deal' Fare Choices for guests who have made bookings prior to 25th September, 2018. On flights within India, all features and benefits, including complimentary meals will continue for Economy fare options viz. 'Saver', 'Classic' and 'Flex and for all fare options in Première. On international flights, all features and benefits under First Class, Première and Economy remain unchanged.